The 2017 Oregon Active Transportation Summit is happening, and TREC and Portland State University are well represented. The event began yesterday, March 20th, and continues through today at the Oregon Zoo in Portland. In a breakout session yesterday afternoon, TREC researchers Sirisha Kothuri and Tara Goddard presented along with Rebecca Sanders of Toole Design Group in a session titled “The Latest in Bicycle and Pedestrian Safety Research” which explored systemic safety analysis, safety performance along road segments, and the psychology of roadway interactions. Kothuri is a postdoctoral researcher and Goddard is a current Ph.D. candidate at Portland State. Both of them have been former NITC dissertation fellows, and Goddard presented her dissertation research on the effects of explicit and implicit attitudes on self-reported safety behaviors in yesterday’s session. Both Kothuri and Goddard are also working on ongoing research through the NITC program. Goddard studies transportation psychology and Kothuri’s research centers on bicycle and pedestrian safety and signal timing. Hilltop Planning, a group of students from the Master of Urban and Regional Planning (MURP) program at Portland State University, received a 2017 Student Project Award from the American Institute of Certified Planners (AICP) for their Planning Workshop project, OHSU Night Access Plan. TREC, the Transportation Research and Education Center at Portland State University, hosted a lunch and information session Friday for Portland State staff and faculty members. The luncheon brought together individuals from a broad range of disciplines. In addition to people from typically transportation-aware fields like civil and environmental engineering, metropolitan studies, urban and regional planning, public administration and the institute for sustainable solutions, representatives of other disciplines also attended, whose fields have the potential to intersect with transportation. The span of fields included engineering and technology management; public health; education; mathematics and statistics; electrical and computer engineering; psychology; geography; computer science; women, gender and sexuality studies; economics and applied linguistics. The gathering served as a way to bring together a diverse group of people from various disciplines who could benefit from connecting with the transportation center’s ongoing programs and research. Portland has established itself nationally and globally as a leader in sustainable transportation, thanks in part to Portland State research and education programs. Portland state’s renown in transportation lifts the entire university’s national reputation, and faculty members whose studies are not directly related to transportation can still benefit from this effect. Vehicle miles traveled, or VMT, is a standard indicator of how many vehicles use a roadway system. A similar metric for bicycles and pedestrians is needed in order to achieve livability goals. Such data can inform decision-making, facility design and planning, and safety analysis. A NITC report from Portland State University evaluates three methods of calculating bicycle miles traveled (BMT) and pedestrian miles traveled (PMT) by applying them to Washington State. 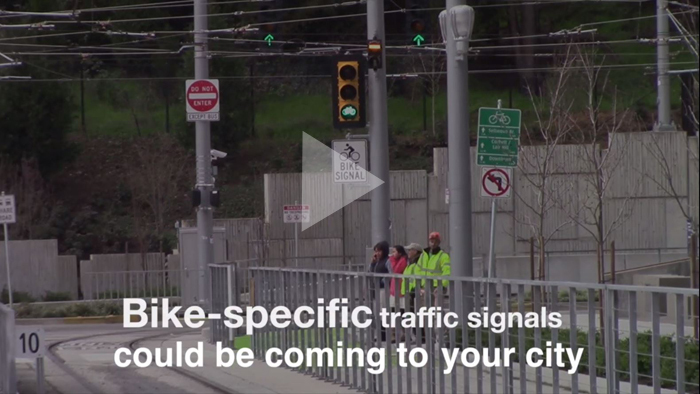 The Washington State Pedestrian and Bicycle Miles Traveled Project was led by Krista Nordback, a former TREC research associate who is now a senior research associate at the University of North Carolina's Highway Safety Research Center. The researchers used data from permanent counters when available; otherwise they used short-duration counts to extrapolate average annual daily bicycle and pedestrian traffic. When the project began in 2012, only one permanent count site existed in Washington, and it only counted bicycles. Nordback’s team contacted state officials to advise that more counters would be helpful; the state listened and installed more counters. Now there are more than a dozen permanent bicycle and pedestrian counters scattered throughout Washington. The event has become a tradition for PSU transportation students. Each January, Portland State graduate students travel to Washington, D.C., to present their research in front of a national audience at the annual meeting of the Transportation Research Board. The aftershock gathering is a chance for fellow students to see the research they presented and hear about the conference. Student posters from TRB were displayed in Rogue’s meeting room. NITC dissertation fellow Patrick Singleton presented his poster on conceptualizing and measuring the positive utility of travel, a product of his dissertation research. NITC scholar Steven Gehrke presented a poster on activity-related land use mix and its connection to pedestrian travel. Travis Glick, the outgoing STEP president, displayed his poster on measuring the determinants of bus dwell time, with new insights and potential data biases. The city of Portland is using research and expertise from TREC researchers to change how it calculates fees for new development. Developers pay the fees, called transportation system development charges, to offset some of the costs of providing transportation infrastructure. The foundation for those fees has been cars: that is, how many car trips a development will generate. In December, the Portland City Council voted to instead use “person trips” as the basis for those fees. Researchers Kelly Clifton and Kristina Currans have assembled an impressive portfolio of research projects on trip generation. Their research caught the attention of city officials, who brought Clifton and Currans in as consultants to help them rethink the way they assess new fees for development. A new NITC report offers a multimodal framework for transportation impact analysis – a welcome tool for professionals in many cities seeking more detailed data about non-drivers. Improving Trip Generation Methods for Livable Communities, a research project headed by Kelly Clifton of Portland State University and Nico Larco of the University of Oregon, is the latest effort in an ongoing collaboration to create more open sourced, widely available data about non-motorized road users. Over the last decades, cities have become more invested in fostering the conditions to support walking, biking and public transit. The land development process presents a unique challenge. Prior to a zoning change or new development, someone has to determine what its impact on the transportation system will be, and whether upgrades will be necessary to accommodate travelers to the new destination. Trip generation is the first step in the conventional transportation forecasting process. Current trip generation methods used by engineers across the country tend to focus on motorized modes.